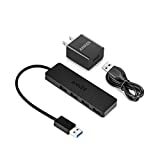 In this day and age USB devices are universal, connecting our computers to USB-based keyboards or printers, charging our various mobile devices, and acting as our modern day hard drives. The dependency on our computer’s few USB ports has never been greater, but fortunately there is now a solution for the “over-deviced” consumer. 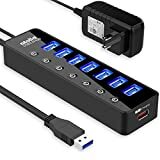 The powered USB hub is a basic device with a simple function, and can support all your various USB connections simultaneously. 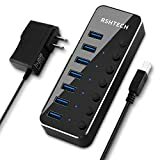 However, there are important factors to consider when choosing the right powered USB hub for your needs. In this buying guide, we’ve broken down what you need to know before making your decision. 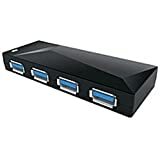 USB 3.0 Hub: The latest powered USB model boasts higher speed, higher power availability, and better power management among connected devices, all while maintaining functionality with USB 2.0 and 1.1 devices. 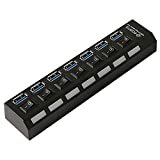 USB 2.0 Hub: Generally sold at a lower cost than the newer 3.0 models, the USB 2.0 is also usually more compact and a very portable product. Some high-speed 2.0 hubs maintain forward and backward compatibility with both newer and older USB devices (USB 3.0 and 1.1). Shared power: Note that since the USB hub is powered by only one USB port on your computer, the power to the hub is split among the ports. 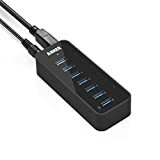 Don’t worry, because a high quality powered USB hub will still optimize the power to multiple devices loaded in the docks. Customer support: USB hub brands offer varying levels of customer support. Some offer lifetime warranties, while others provide limited years of insurance and protection. Make sure to choose a brand that has reliable customer service in case of glitches or product failure. 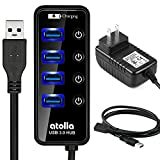 Quality is vital: A reliable USB hub that does not drop its connections is crucial. What is most important at the end of the day is to have a hub that works. Consumer reviews speak to prioritizing quality over price. Note how many ports the powered USB hub provides and make sure that it is enough to serve all of your needs. Always opt for a few additional ports in case you acquire more USB devices over time. 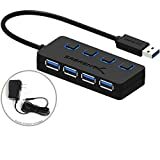 Make sure to select a USB hub that is 3.0 compatible but is also backwards compatible with USB 2.0 and USB 1.1 devices to ensure all of your devices—both new and old—will properly connect. 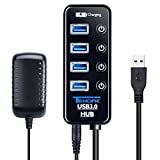 Note if the USB hub has its own power adapter and cable for connections needing greater power output. If not, you will need to buy a converter independently. Durability is important to consider so that your USB hub doesn’t overheat when supporting multiple devices. HooToo: Established in 2008, HooToo has made a name for itself as an international consumer technology brand that specializes in small electronics and accessories. Anker: Founded by an international group of techies passionate about making technology easier to enjoy, Anker focuses on the consumer perspective prioritizing quality and user satisfaction. Plugable Technologies: Began in 2009 and focuses on online sales to provide customers with better products, information, and support. Plugable is now one of the best-known brands selling USB, Bluetooth, and other power-related devices. 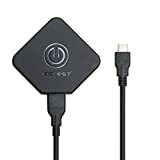 AmazonBasics: Launched launched by Amazon in 2009, AmazonBasics primarily sells electronic accessories through its mother company at a competitive price.